Holiday sweets are everywhere. On the filing cabinet in the hallway of your office, on the coffee table of friends, in your kitchen waiting to be wrapped up and handed out to family and colleagues. It’s the season of giving, after all. However, among all the sugary kindness, my body craves vegetable goodness. Which is exactly what this soup is. I made this soup for the first time when the weather had just started turning cold. On that night, one of my best friends came over for dinner. We hadn’t seen each other in a little while and despite the exhaustion of a long day’s work, we were both giddy with excitement about spending an evening together. 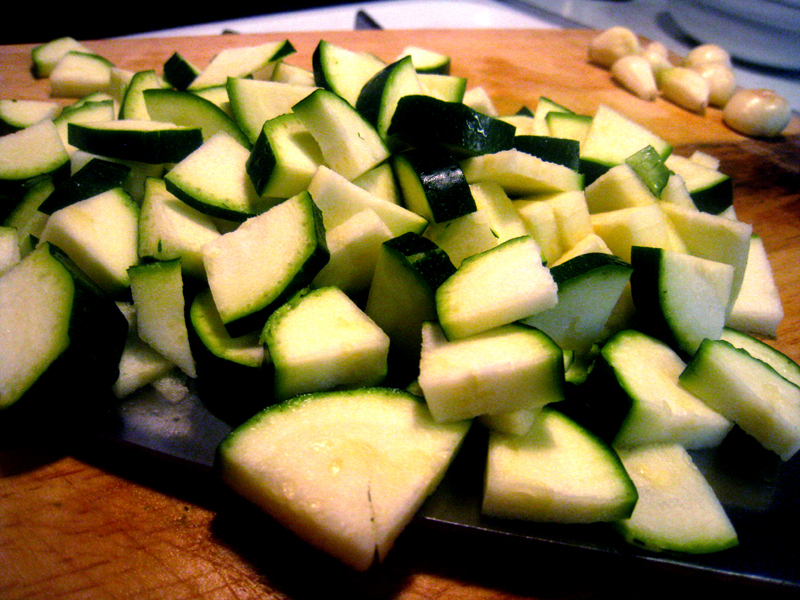 We stood in the kitchen talking, laughing, and sipping wine while I diced zucchinis and washed spinach. Soon enough, our stomachs started growling and we became impatient to eat. Luckily, this soup is super quick (in addition to being really easy). And despite all that green which looks too healthy to be "good," this soup definitely falls in the comfort food category. 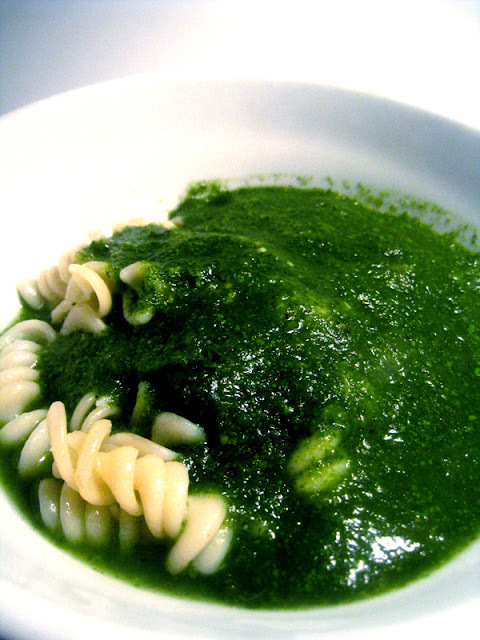 The mix of pasta, pesto, and parmesan topped with a spinach-garlic-zucchini purée just hits that perfect sweet spot on a cold winter night. Within minutes, we were ladling up huge spoonfuls and bringing our steaming green bowls into the living room to sit by the fire, eat, and talk the night away in that cozy way special to old friends. While noodles are cooking, sauté onions, salt, thyme and oregano on medium heat until onions are translucent. Add garlic, zucchini, and spinach. Continue cooking for another five to eight minutes until zucchini is tender and spinach is wilted. 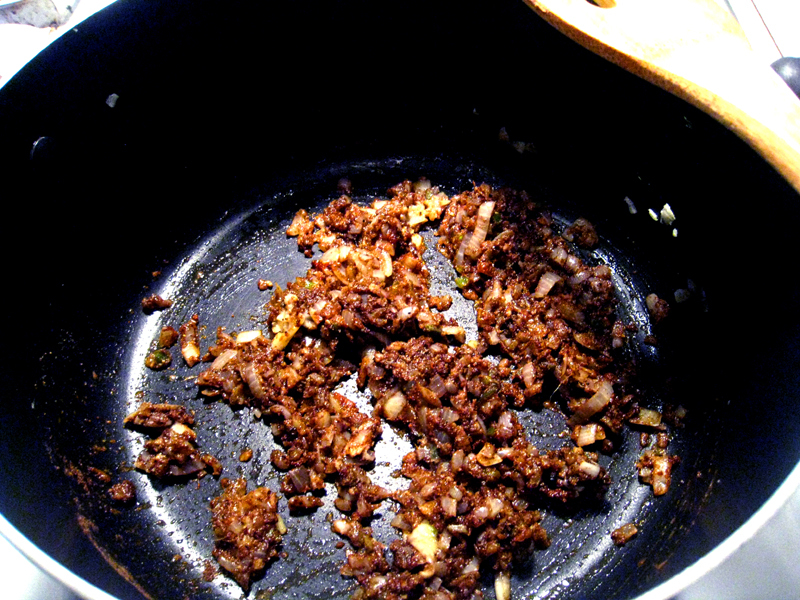 Add water and black pepper to taste (add more salt if necessary), and cook for another five minutes. Purée soup in a blender in two batches (or purée directly in pot with an immersion blender). 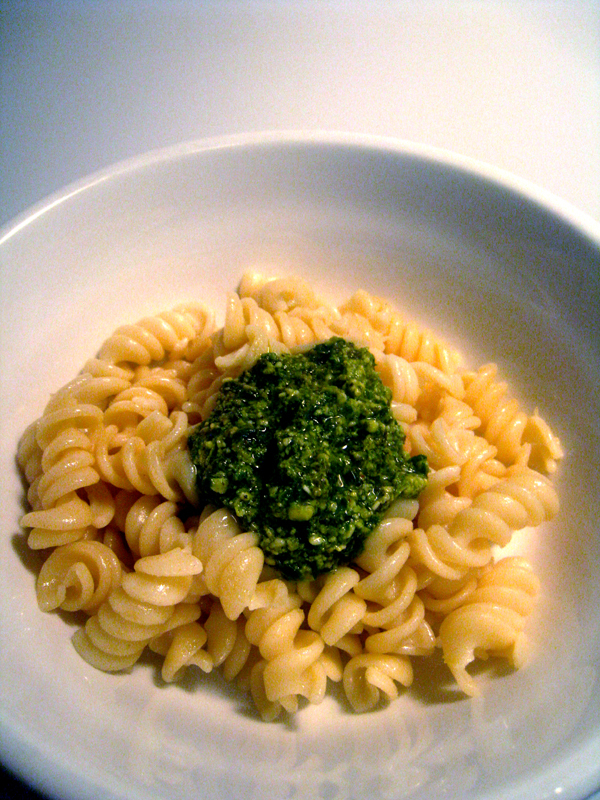 Divide noodles among the bowls, add pesto (about 1 tablespoon per serving), ladle soup over everything and top with parmesan. Eat immediately! I made this cake a couple weeks ago on an evening when I had the house to myself. The Christmas tree was twinkling, its reflection making the living room windows glow with the light of a hundred fireflies. An old 1960 album was crackling on the record player, filling the air with ageless Christmas carols. 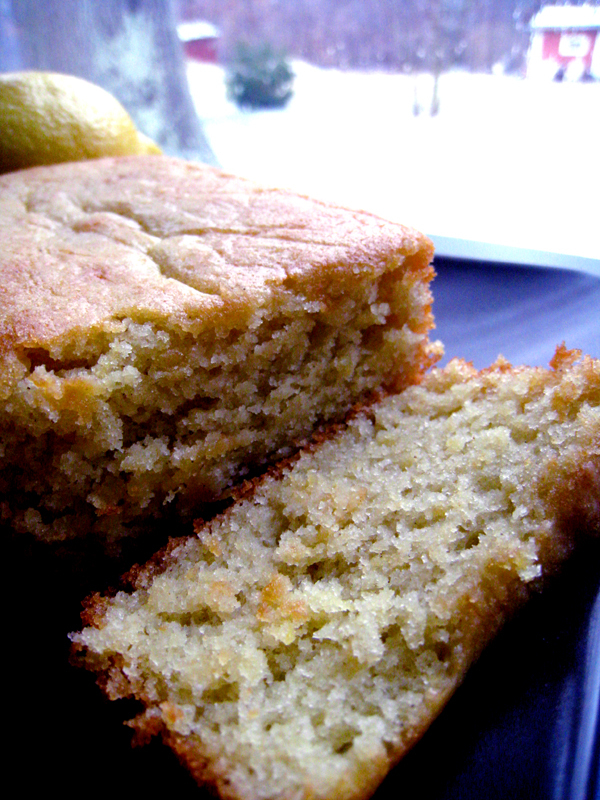 I was in the kitchen, singing along to Bing Crosby’s “Frosty the Snowman” and baking the best cake I had ever tasted. I didn’t know this yet, at the time, seeing as I was still in the process of making it. But an hour later, the house smelling delicious and the album having been turned a couple times, the cake was cool enough for me to try. I watched the knife slice right through its moist yet firm body and raised a slice to my mouth. That first bite hit my senses with such force that I found myself closing my eyes and gasping in startled pleasure. It was, quite literally, the best cake I had ever tasted. The lemon gives this cake a light playful taste, while the olive oil adds an unexpected depth and just enough moisture to make each bite deliciously melt on your tongue. 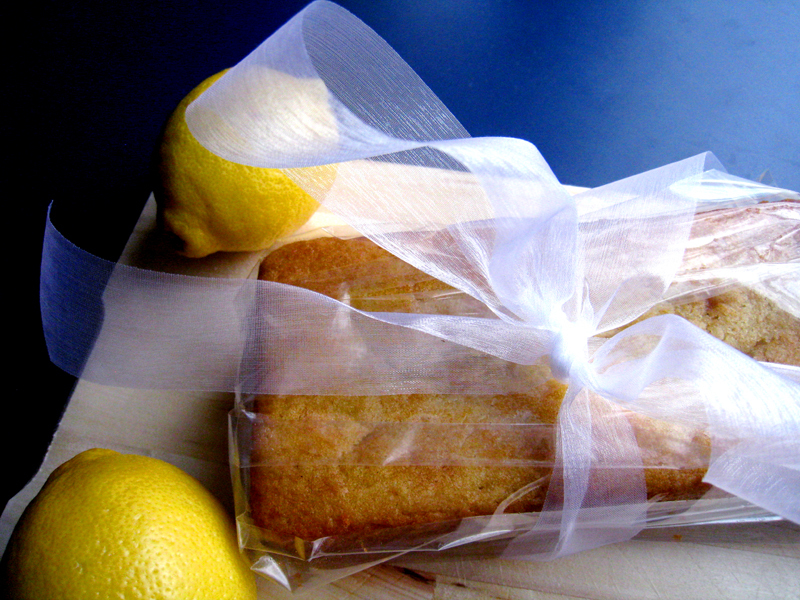 The consistency is similar to a pound cake, only this Italian-flared version includes no butter. Plain yogurt and extra virgin olive oil are the only ingredients used for moistness. This makes the best of gifts. It wraps up beautifully and everyone (gluten folks included) will think you handed them a little piece of ecstasy upon trying it. It also makes a wonderful hostess gift for that New Year’s Eve party you’re attending. Enjoy with friends and deep belly laughs. Tis’ the season of giving! Put oven rack in center position and heat oven to 325°F. Lightly oil two 7.5X3.5 baking pans (or a 9-inch springform pan if you want to make one round cake). Whisk together the gluten-free flour, xanthum gum, baking powder, baking soda, and sea salt in a medium-sized bowl. In a large bowl, beat the eggs and sugar until pale and thick on high speed (about 5 minutes). Add the lemon zest and yogurt and beat on low speed until well mixed. With mixer on medium speed, add the olive oil in a steady stream. Reduce speed to low and add the dry ingredients until just blended (or mix by hand with a whisk). Divide batter into the two baking pans and place in the middle-rack of oven. Bake for 40 minutes, rotating once at the twenty minute mark. Let sit in pan for a couple minutes before taking cakes out and setting them on a cooling rack. Let cool completely before slicing (or at least until the cake is just warm - I couldn't wait until it was completely cool!). If making one cake, pour batter in springform pan, bake in middle rack for 40-45 minutes, rotating once. This is a wonderful cake to share with friends over a cup of tea during an afternoon break. Two weekends ago, Josh and I were at brunch at Watts Grocery enjoying a delicious Fall Egg Scramble when he leaned over to me, pointed toward the window, and in one excited breath whispered "It's snowing!" I looked outside, and sure enough, big white snowflakes were dancing everywhere. They were blowing this way and that, making little somersaults in the air and sticking to people's hair and coats as they walked by the restaurant windows. It looked like a scene from a movie. I couldn't remember the last time North Carolina had seen snow this early. There was a buzz of excitement in the air. We walked onto the sidewalk and saw two little girls running hand in hand, mouths opened wide with tongues stretched out catching the snowflakes as they fell, giggling the whole time. Couples were smiling, walking arm in arm and looking up toward the sky. 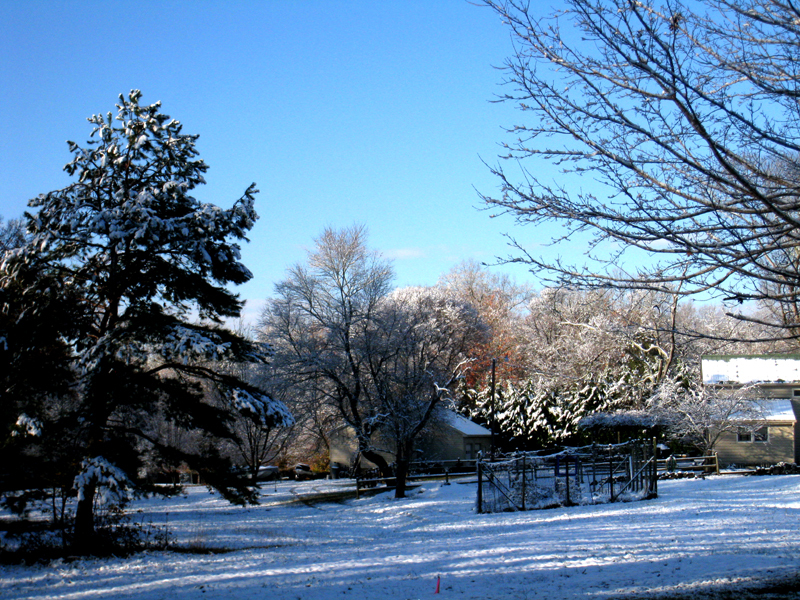 There is something magical about the first snow of the season. It speaks of cozy winters, Christmas trees, hot chocolate, and warm evenings spent with friends and family by the fire. It also says "The holiday season is here! ", which to me means baking time. 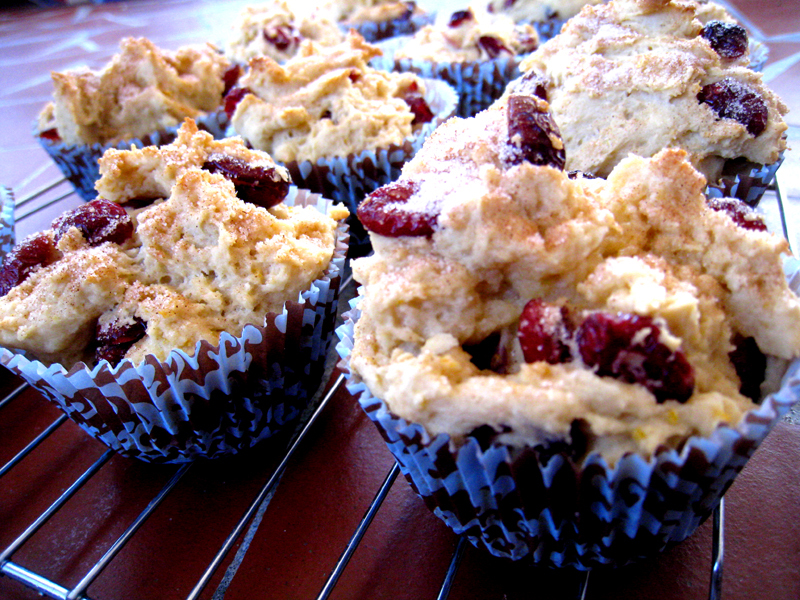 So the next morning, with a blanket of snow on the ground and crisp blue skies all around, I made cranberry orange muffins. What I love about these muffins is that they taste of the holidays without all the excess sweetness you usually get. The tartness of the cranberries and the slight bitterness of the orange rind complement each other perfectly. Preheat the oven to 350ºF. Line 12 muffin cups with paper liners. Mix together the brown rice flour, potato starch, sugar, tapioca starch, almond meal, baking powder, egg replacer, xanthan gum, and salt. In a separate bowl, whisk together the milk, butter, and eggs. Form a well in the dry ingredients and add the wet ingredients. Mix until well blended. Fold in the orange zest and cranberries. 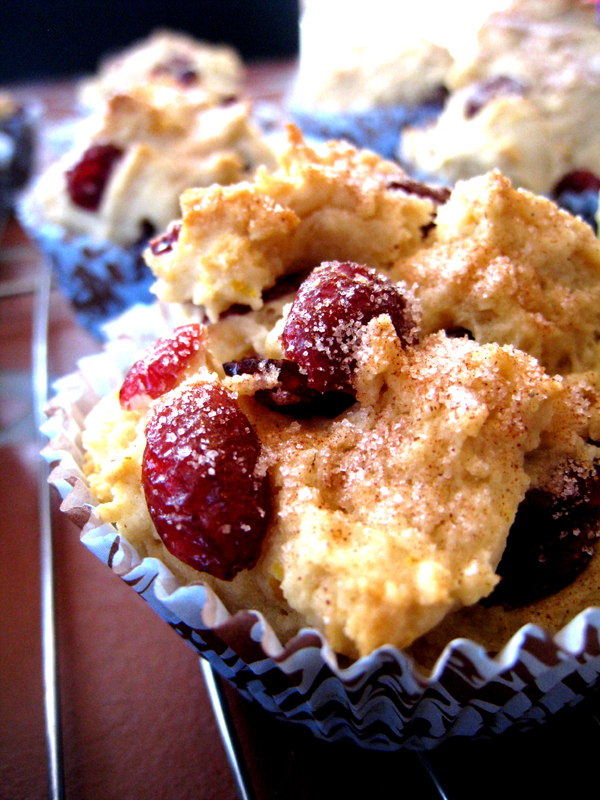 Spoon the batter into the muffin cups and sprinkle each top with cinnamon sugar. Bake for 15 minutes. Take muffins out of oven and allow to cool in pan for a couple minutes before transferring to a cooling rack. Enjoy with a hot cup of coffee or tea! Like I've been saying, it's cold here. Really cold. Like, ridiculously cold. I've decided I'm allowed to complain about it until true winter arrives, because technically it's not winter until December 21st. So these temperatures are entirely unacceptable until then. So, as I was saying, in order to survive these ridiculous temperatures I need to cook very hot, very spicy things. Things that make me feel like I'm in some faraway part of the world where temperatures are more civilized and hotter. Like India, for example. A couple days ago, I ventured across the street from my office building to the natural food store that has a delicious hot buffet to check out what lunch options could hopefully heat me up. They had a couple soups (most containing wheat, which thankfully they write down) that I unceremoniously dismissed, and then I saw it. Right there, in the middle of all the choices, was a fresh pot of Chana Masala. The chickpeas looked so hot and inviting in their obviously spicy and still-simmering dark sauce that I immediately filled up a big cup of it and brought it back to my desk. Once back in the relative warmth of my office, I shrugged off my coat, sat down, and wrapped my hands around the cup, letting the heat seep through to my frigid palms. Then I dug in. WOWZER. Talk about SPICY. Within a couple bites, I was peeling off layers of clothes and blowing my nose. I had to take breaks in order to make it through the whole cup. And by the end, every inch of my body was warm. So, of course, I decided I needed to replicate it when I got home. Which I did. The result was a comforting bowl of kick-in-the-pants spiciness. I hope it warms your entire being up as much as it did me! WARNING: This recipe is spicy. Josh literally had sweat rolling down his face as he ate it. We love spicy, so it was a big hit here, but if you would like to tone it down a bit, just omit the green chili and cut down on the chili powder. Although, I recommend it as is. 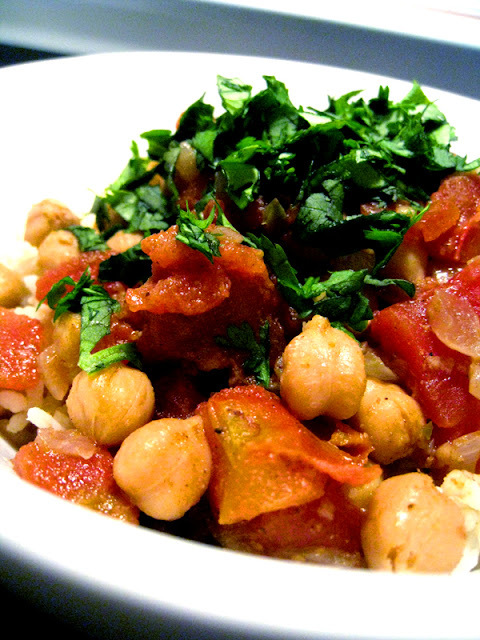 Chana Masala, after all, is supposed to make you sweat a bit. 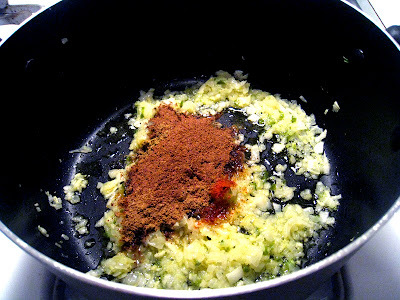 Sauté the onion, garlic, ginger, and chili in the oil until transparent and well-cooked (about 5-8 minutes). Add the spices and cook another two minutes. Add the yogurt and stir another minute. Add the tomatoes and cook another minute or two. Add the water, chickpeas, juice of 1/2 lime, plus the lime, and bring to a boil. Turn heat to low, add salt and mix in well. Partially cover the pan and simmer for 30 minutes. Remove lime and simmer for another 30 minutes, until liquid has reduced some and the sauce is thicker. Serve piping hot over basmati rice and garnish with cilantro. Eat and be warmed! It has been SO cold lately, it’s not even funny. It was 18°F at 7am yesterday morning. 18°F!! In North Carolina! In early December! It’s pure craziness. Us poor southerners are not used to these kinds of temperatures so early on and we spend our days shivering and unable to get warm no matter how many layers we pile on. Or maybe that’s just me. Either way, this weather makes me want to spend my time (all of it) with my feet inches from a fire, or deep under the covers with a good book. And it makes me want to make hot, hot things in the kitchen. Like spicy black bean soup. I got home last night and immediately turned to the cupboards and fridge in search of something that would warm me inside and out. I wanted comfort and I wanted heat. I reached for black beans, a red pepper, onions, garlic, and lots of spices. And I set to work. 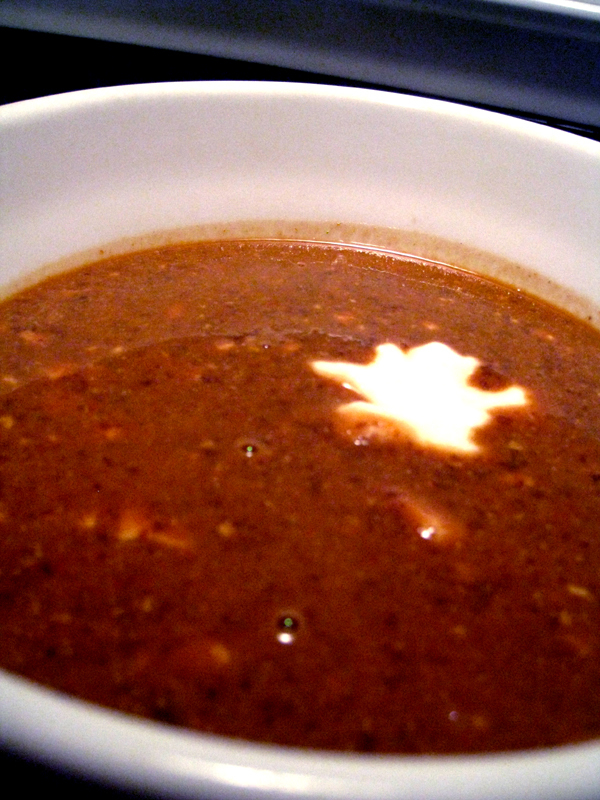 The result was a make-you-sweat (only a little, though) sPiiiCy black bean soup. It did the trick - made me warm all over. Josh even decided to go for a walk outside after a bowl. It didn't quite have that effect on me, but pretty close. If you're looking for something to heat your soul after those frigid temperatures outside, I suggest a bowl of this soup! 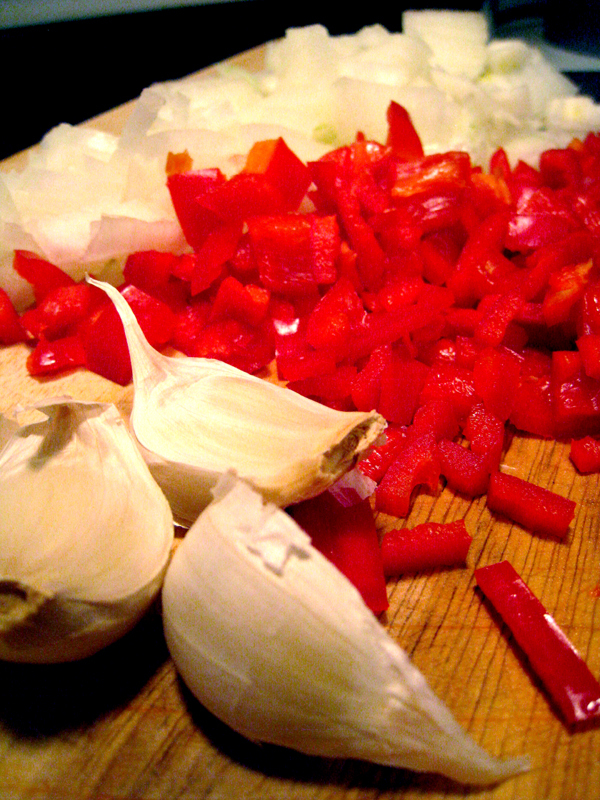 Sauté the onion and pepper in olive oil on medium heat until the onion becomes translucent (about 4-5 minutes). Add the garlic and sauté one more minute. Add the spices and cook, stirring constantly, one more minute to bring out their flavors. Add the beans and stock, bring to boil, then lower heat and simmer ten minutes. 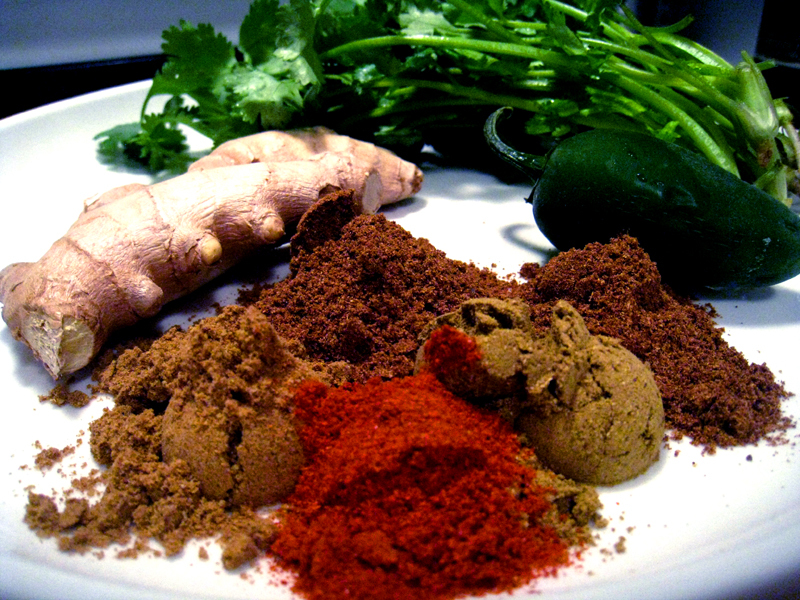 Blend soup in a blender (or in pot with an immersion blender). Return to pot, add lime juice, salt to taste, yogurt (if desired) and reheat. Serve hot, hot, hot! I have a new love. Once you check out the cookbook Clean Food, I'm guessing you will to. I have a lot of health cookbooks that concentrate on whole foods and healthy meals, but this one is different. It still does all of that, but it also incorporates a truly holistic approach to health. One that is about balance and not just food. As her website states, Terry Walters (the author) "is all about good health - body, mind, and soul." Ah, happy words. Plus, her recipes are absolutely delicious. What more could you ask for? I have been flipping through the cookbook every chance I get - it's on my nightstand at night, on the couch with me in the morning while I drink my coffee, and in my bag when I leave for work so that I can read it on my lunch break. I have been wanting to make almost every recipe I read. Immediately. Unfortunately, I can't drop everything and spend my days in the kitchen (no matter how hard I wish I could), but I can spend my evenings there. 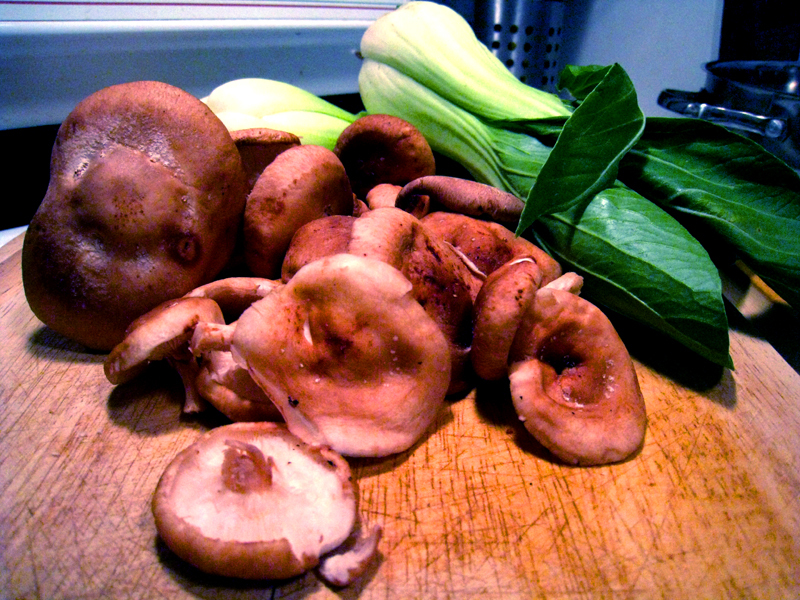 Last night I made a stir-fry with bok choy and shiitake mushrooms. Shiitake mushrooms have been a staple of mine for some time. I absolutely love their taste and versatility, not to mention their amazing health benefits, so they end up in at least one or two meals a week. Bok choy, on the other hand, is not usually a vegetable that I buy. It's not that I don't like it, but habit usually has me reaching for kale or mustard greens or swiss chard when it comes to my regular leafy greens. After the meal last night, however, bok choy is sure to become a much more frequent visitor to the kitchen. It's absolutely delicious (with surprisingly tender sweet leaves)! 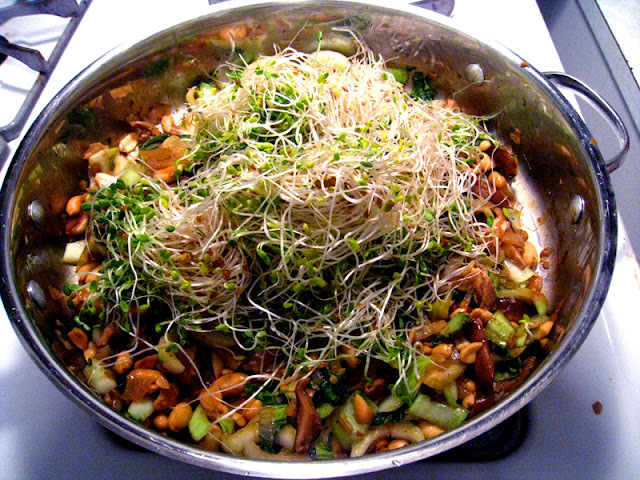 This recipe also includes onion, ginger, garlic, and clover sprouts. Talk about health in a bowl. And did I mention that it's delicious? In a large skillet, sauté the onion, ginger, and garlic in the olive oil until onions are translucent (about 5 minutes). 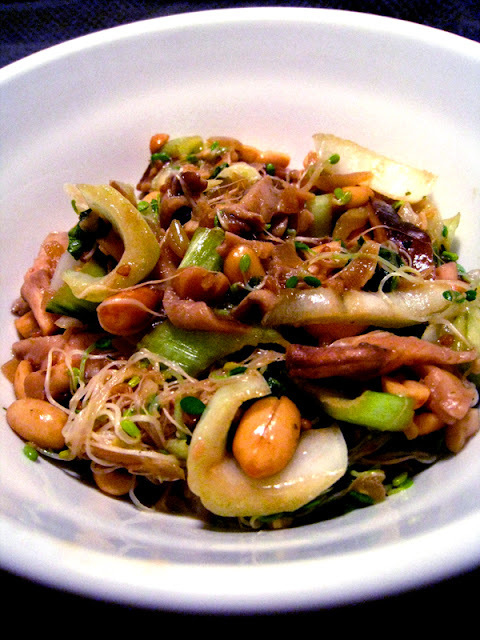 Add the mushroom, half the tamari and peanut sauce and cook for 5 minutes until mushrooms are caramelized. Add one tablespoon of water at a time to deglaze pan as needed. Add remaining tamari and peanut sauce and continue sautéing the mushrooms another 3-4 minutes. Stir in bok choy and mix with other vegetables until well blended. Cover pot and steam for one minute. Uncover, fold in sprouts and cook everything for one more minute. Stir in peanuts and serve hot.